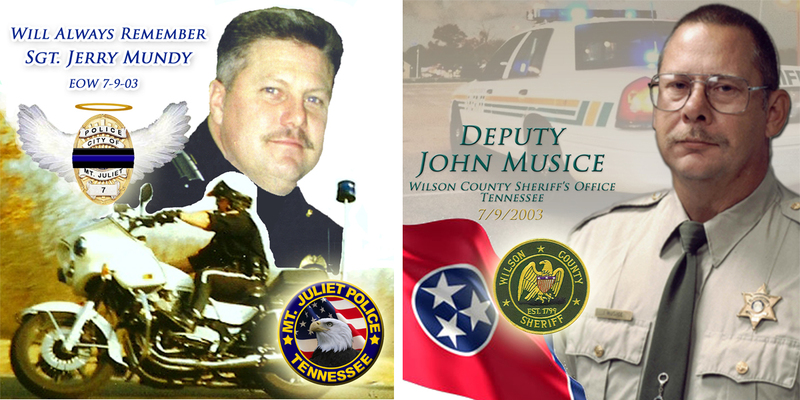 Ten years ago today, two of Wilson County’s finest law enforcement officers gave their life to our community as they attempted to stop a dangerous fleeing felon who had no care for anyone’s safety. Just after 9:00 a.m., Sgt. Jerry Mundy (MJPD) and Dep. John Musice (WCSO) were deploying spike strips in an effort to stop a criminal who fled to Mt. Juliet from Knoxville and continued to run from police. That criminal saw the officers deploying the spikes, and she directed her car directly at them. Unfortunately the officers could not run faster than a speeding car, and they were murdered on Interstate 40 in Mt. Juliet. Law enforcement officers have a very dangerous job, but someone in our community has to step-up to keep us all safe. There are evil people in our society, and law enforcement officers stand strong and defend the thin-blue-line that separates the good from evil. 148 other officers were killed in the line-of-duty and gave the same sacrifice that Jerry and John did in 2003. Since their deaths, over 1600 law enforcement officers have been killed in the United States while serving and protecting our communities. That number is way too high. Just like Jerry and John, their families lost a loved one, and their communities lost a hero. Everyone at the Mt. Juliet Police Department appreciates the support as we cross into the 10th year since the tragic events on July 9, 2003. This is something we will certainly never forget, and Jerry and John will always be in our hearts and on our minds as we continue to serve and protect one of the best cities in Middle Tennessee. Thank you Mt. Juliet. We are here for you, and we will do whatever it takes to keep you, your family, and our community safe. Mt. Juliet Police Make List for Top 10 Twitter Followers in U.S.